Pitch-dark. LG's K10 wants to add style to the lower mid-range. Read why its screen and the camera's gloomy photos stand in its way in this report. The LG K10 is a relatively affordable MetroPCS phone with a nice design and a decent display, but it comes up short everywhere else. For even less money, the ZTE Zmax Pro gets you a faster processor, more RAM, a sharper display, a better camera, longer battery life, and a fingerprint sensor. It's a better choice in every way, provided you're comfortable with the fact that it's huge. If that's not your cup of tea, the Samsung Galaxy On5 offers a similar level of performance to the K10 in a smaller form factor, and is easier to recommend because of its lower price. The budget smartphone has completely changed over the past two years or so. Earlier, phones were made of plastic, had HD or lower resolution screens and performance was sub-par. This is the market that the LG K10 competes in. LG's interface has become simpler and less cartoonish over the years and it doesn't introduce any lag as such on the K10, but at the same time, this is no blazing fast phone. LG says the glossy pebble design is meant to appeal to young people but yet, the performance on the phone isn't fast enough to satisfy the content-hungry gaming youngster. 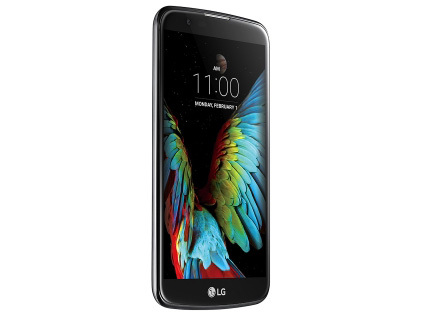 The LG K10 brings freshness to the mid-range, but the competition in this price range is more than fierce, so it will be difficult for this device to become a breakthrough. With the exception of the not so enduring battery, we have no other remarks as regards this model. We were pleased by its nice design and the 13Mp camera, which showed decent results. The Snapdragon 410 chip justified our expectations of reasonable performance and maintenance of low exterior temperatures after load. LG’s UI, on the other hand, did not fail to provide a number of pre-installed apps, modes and functions – all this being ordered and dressed very neatly. Last but not least is the 5.3″ display, which offers not only enough room for operation, but also reasonable detail and color contrast, thanks to the HD resolution and IPS technology. LG has given the K10 LTE an MRP of Rs. 13,750, which straight up feels way too much for what's on offer. It feels like the phone is competing with the wrong crowd, and it's hard to justify this price tag with this feature set in mid-2016. A more appropriate price level would be about half this much, considering there's nothing really special about it other than its design, a good screen, and decent battery life. The LG K10 LTE scores when it comes to the build quality of the phone and design, but fails to impress with its specifications and internal features. For the price of Rs, 13,500, the phone comes with an average display, which is a let down. Although the macro shots are good , the camera is not the best for the price. Next up, the phone lacks a fingerprint sensor. It is 2016 and you got to have a fingerprint sensor on your device, at least for a price like this. Solides Alltags-Smartphone für unter 200 EUR? 71.13%: This rating is bad. Most notebooks are better rated. This is not a recommendation for purchase.